Our Sheltie breeder posted some info about an artist on her Facebook page. Right now it appears as though she only has a Facebook page but as soon as she has a website I’ll post the link. Search “Shannon Darch Animates” for more information…. 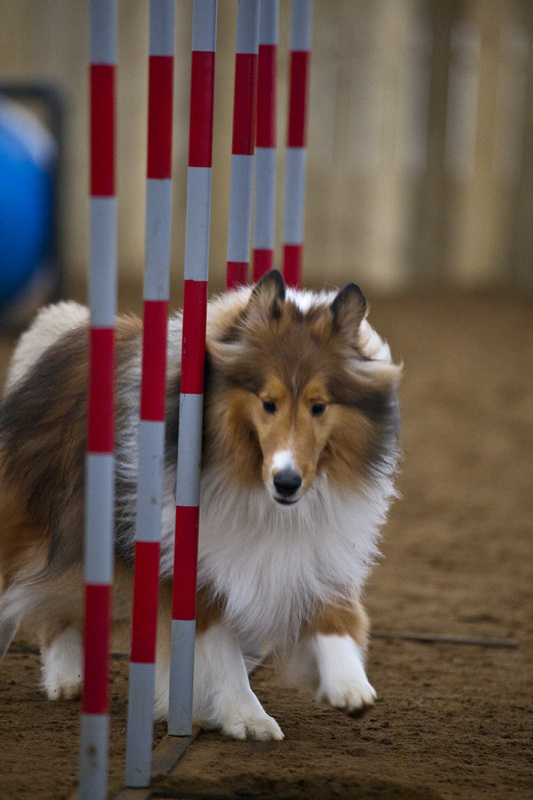 I came across a great agility blog yesterday in my search for agility tips. He also has a Facebook page. Hope you like it as much as I do. Yesterday we took our very first trip out to Red Gate Arena . 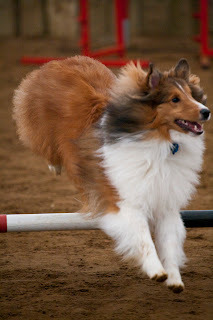 We were invited out by an acquaintance who would be working her two Shelties that evening. Since we definitely need the work, and I would never turn down the opportunity for some agility fun, we headed across town…way across town. What a fabulous place! Clean, lots of space, and great equipment! Travis and Indie made fast friends with the other dogs (even though one of other males peed on Travis’ head – it was amusing) and played and ran around the arena like crazy! 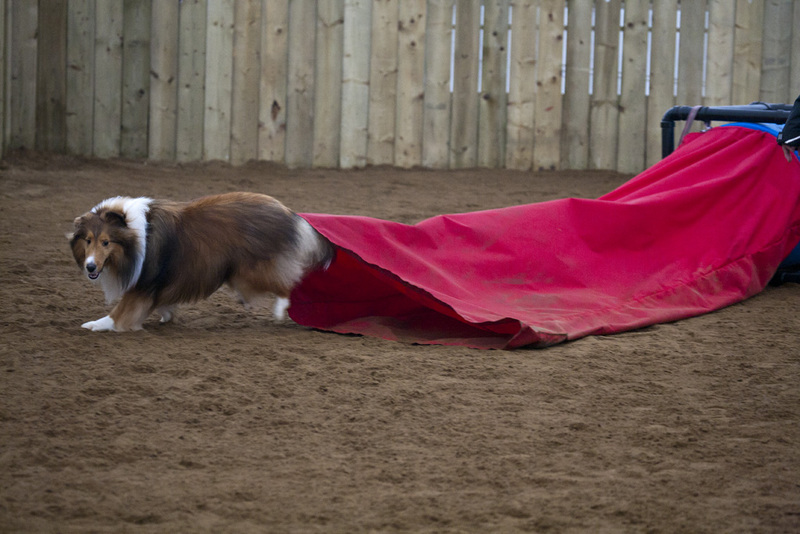 I was never sure if Travis really, really liked agility, but he proved he does by flying around and taking jumps all by himself – I would have been really impressed had he laid-down when he jumped up on the table, but I can’t really blame him with all the fun he was having. Well it was time to get down to business. My first task was getting Travis into some weave poles. He did ok, but he popped out a few times which I didn’t expect. I think it was because the poles were set a little closer together (21″) than what we had been training on at home. He was having a hard time collecting himself, but practice makes perfect. Not wanting to leave Indie out of the excitement, I switched dogs and introduced him to a 6″ jump. 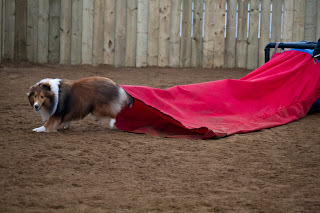 It was more for me to learn some new handling skills than for Indie – his focus just isn’t there yet. We tried some tight turns and we had some success which I am more than happy with – no need to rush him. Then back to Travis for some work on the – very scary – teeter-totter. When working in the outdoor field he was doing great and he had lots of confidence on all the equipment. As soon as we moved indoors the “bang” from teeter going down, and then back up, freaked him out. It had been next to impossible to get him back on it. We tried a few times, and then a few more. I lowered the teeter to about 12″ and then we started progressing. We’ll need to work on his confidence over the next 2 weeks or we won’t do well at our first trial on April 1. It is only a matter of repetition for Travis; he just needs to be desensitized to the noise. I’m going to try to make arrangements to go two or three more times before the 1st – combine that with our Sunday classes – so we can have more confidence building time and practice some new handling skills. I’m really proud of the progress the boys have made – I’m sure it only gets better from here!